Valencia, California, January 9 – Gantom Live! (the division of Gantom Lighting & Controls that specializes in live entertainment) will be unveiling its ZTag game designed for retail outlets and haunted attraction owners at the Halloween Party & Expo from January 14-17 at the Ernest N. Morial Convention Center in New Orleans as well as the Haunted Attraction National Tradeshow and Conference (HAuNTcon) from January 26-30 at the Sheraton Music City Hotel and Conference Center in Nashville. In ZTag, players wear infrared (IR) badges that interact not only with the environment but with each other. 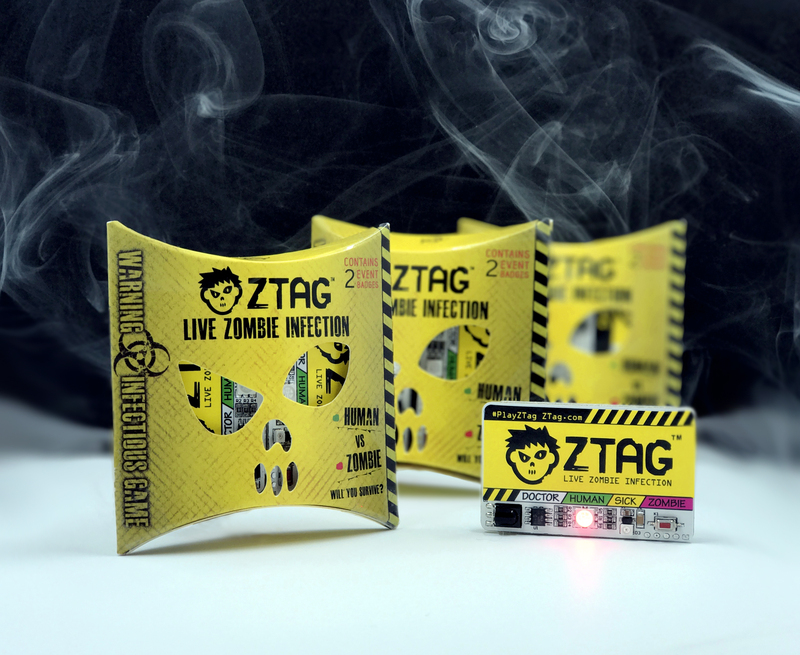 Players experience a real-life zombie infection outbreak using smart badges. The smart badges are programmed to allow players to engage in different challenges—they can try to infect each other or work together in teams to find a cure. The investment cost for ZTag is low, and the system acts as a profit center for an attraction through souvenir sales or as a ticketed experience. This iteration of the Torch Technology was released at the 2016 IAAPA convention in Orlando, but Gantom Live! now has a retail kit available for direct sale to consumers. 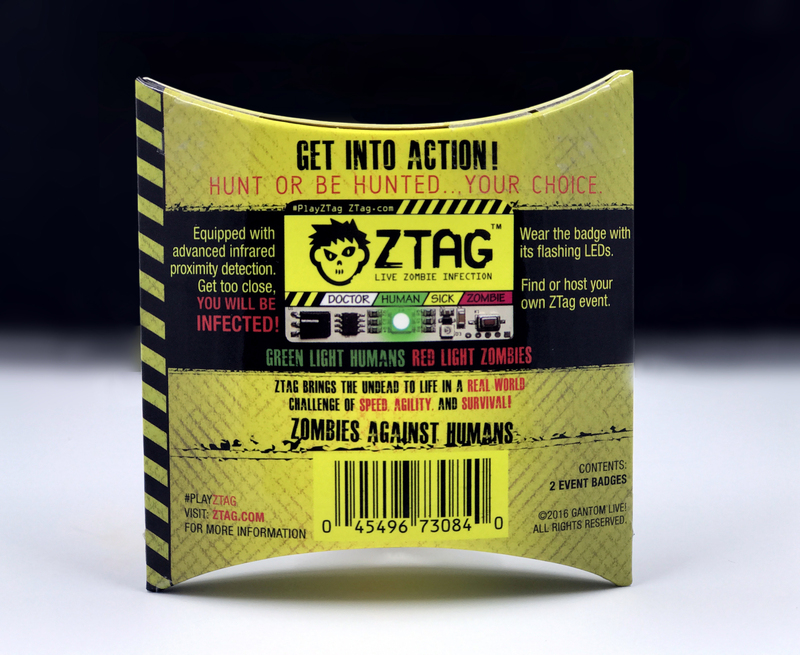 The retail version of ZTag allows for a Live Zombie Simulation Game anywhere, in player groups from 2 to hundreds. Badges are sold in two-packs and allow players to play ‘Zombie’ Tag using the smart badges right out of the box. This retail model paves the way for the next stage of Gantom Live!’s ZTag product development—players who buy the smart badges at retail stores can take those badges to attractions and play larger, themed and sanctioned games. The retail packaging design is by C2C Studio in Pasadena, California (www.c2cstudio.com). ZTag is based on Gantom Torch Technology, an infrared (IR) based communication system for themed entertainment use. IR beacons are placed throughout a venue to transmit live show data to guest wearable lights that interact with the environment, providing an interactive and immersive experience for each guest. When Torch modules come into range of a transmitter, they synchronize to show data as guests travel from one space to the next. Gantom Torch Technology was a recipient of the 2016 Thea Award for outstanding achievement in technology designed for a limited budget. “Every single day we work to ‘Illuminate and Inspire’ the future of themed entertainment,” says Quan Gan, Founder and President of Gantom Lighting & Controls. “ZTag is the next stage of Gantom Torch Technology,” he explains. Gantom, formerly Darklight, was founded in the Spring of 2010 as a manufacturer of special-effects lighting equipment catering to the themed attraction industry. The company specializes in illumination of low-light and space-constrained environments where traditional theatrical luminaries aren’t suitable. Its award-winning products are the “secret weapons” of many lighting designers and industry experts and have been installed around the world in a wide range of applications including theme parks, museums, bars and clubs, and haunted attractions venues.